Tupperware was introduced in the Philippines in 1966 and has since become a household name, changing the lives of millions of Filipinos through its world-class products and the limitless income opportunities it offers. In 2007, Tupperware Philippines merged with Sara Lee Direct Selling Philippines to become what was known as Fullerlife Direct Selling Philippines. Today, we are proudly known as Tupperware Brands Philippines to reflect our strong heritage while conveying that we are a multi-brand, multi-category direct sales company. I've known Tupperware for its colorful plastic storage that has different sizes and shapes. My Nanay had Tupperware collections when we were young. I loved the stacks container and I was always excited to see the smallest of the set. After a couple of years, Tupperware is now offering not just the items I used to know as a child, but also products for Baby, Cosmetics, Fragrances, Personal Care and many more! I am so thankful to receive these loot in the mail a few weeks ago. 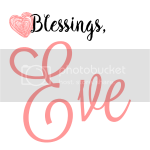 I'm not really new to Baby Care Plus+ and Kids Plus+ Products from Tupperware Brands because a dear friend of mine gave me a set on my 29th birthday. Gentle, ultra-fine powder ideal even for sensitive babies. With Allantoin that works as an anti-irritant to soothe and protect baby's skin while keeping it fresh and dry! This low-dusting, mild formula also decreases the risk of inhalation. Comes in a mild, powdery scent that babies enjoy. A light lotion that's smooth and gentle on the skin. With 24Hr locked-in moisturizers that lock in moisture and Vitamin E to leave baby's skin feeling velvety smooth and soft all day. With a mild pH-balanced formula that won't irritate baby's skin and a mild, powdery scent that babies enjoy. A gentle low-alcohol cologne with a special Hydraplus formula that contains moisturizers to help prevents dryness, leaving baby's sensitive skin soft, smooth and freshly fragrant. With a mild pH-balanced formula that won't irritate baby's skin and a mild, powdery scent that babies enjoy. 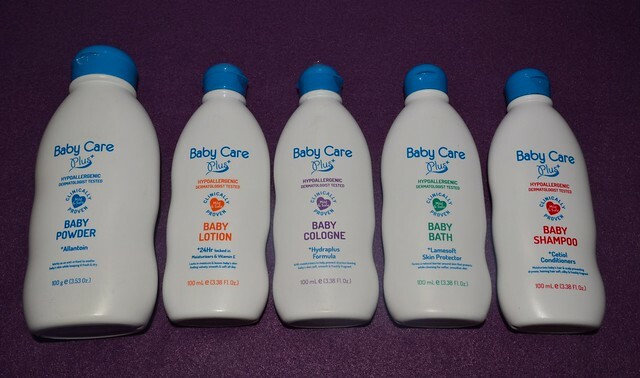 Gently cleanses and conditions baby's sensitive skin and hair leaving it soft, smooth, & freshly scented. With Lamesoft Skin Protector that forms a natural barrier around baby's skin to protect while cleansing, giving baby softer, smoother skin. With a mild pH-balanced formula that won't irritate baby's skin and a mild, powdery scent that babies enjoy. Gently cleanses and conditions baby's sensitive hair and scalp. With Cetiol Conditioners that moisturize baby's hair and scalp, preventing dryness while leaving it feeling soft, silky, and freshly fragrant. With a mild pH-balanced formula that won't irritate baby's skin and a mild, powdery scent that babies enjoy. All are dermatologist-tested and hypoallergenic. A gentle low-alcohol cologne with a special Hydraplus formula that contains moisturizers to help prevent dryness, leaving kid's sensitive skin soft, smooth, and freshly fragrant. With a mild pH-balanced formula that wont irritate kid's skin. This fun, fruity scent that kids enjoy lasts up to 3 hours before you need to reapply. A light lotion that's smooth and gentle on the skin. With Nectapure to protect against pollution and 24Hr locked-in moisturizers and Vitamin E to leave kid's skin feeling velvety smooth and soft all day. With a mild pH-balanced formula that won't irritate kids skin and a fun, fruity scent that kids enjoy. A gentle low-alcohol cologne with a special Hydraplus formula that contains moisturizers to help prevents dryness, leaving kid's sensitive skin soft, smooth, and freshly fragrant. With a mild pH-balanced formula that won't irritates kid's skin. This fun, fruity scent that kids enjoy lasts up to 3 hours before you need to reapply. 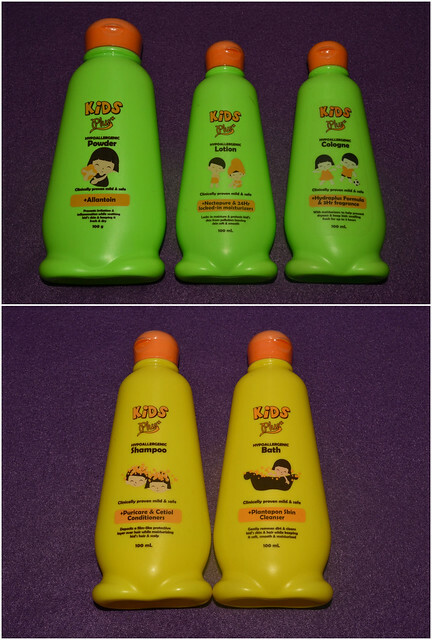 Gently cleanses and conditions kid's sensitive hair and scalp. With Puricare and Cetiol Conditioners that deposit a film-like protective layer over hair while moisturizing kid's hair and scalp. Prevents dryness and leaves hair feeling soft, silky and freshly fragrant. With a mild pH-balanced formula that won't irritate kid's skin and a fun, fruity scent that kids enjoy. Gently cleanses and conditions kid's sensitive skin and hair. With Plantapon Skin Cleanser that gently removes dirt and cleans kid's skin and hair while keeping it soft, smooth, and moisturized. With a mild pH-balanced formula that won't irritate kid's skin and a fun fruity scent that kids enjoy. All are also dermatologist-tested and hypoallergenic. My boys have a very sensitive skin, most especially my eldest who has eczema and had some history of skin irritations whenever he is exposed to strong ingredients. He is now 8 years old and would you believe that he is still using Baby Wash and Baby Shampoo for his everyday bath? Every time we try products with strong contents, his skin will react right away and will give him rashes. We only have few products that we can use for him and we stick to it. I've mentioned that we are not new to these products. We were able to try the powder and cologne in the past and I just love its scent. The powdery and fruity smell makes my kids feeling fresh. I kind of favorited the powdery scent though. Given my kids' skin condition, what I do is, If I'll be using the powder, I'll skip the cologne or use the cologne but use another powder that doesn't have a strong smell. I don't use them both at the same time. I'm a bit hesitant to try the Bath and Shampoo though. Based on experience, my kids' skin gets irritated on other brands of Bath and Shampoo. Our Pedia warned us not to use products that have a strong smell. She explained that the strong the smell is, the more chemicals it has. We are not even allowed to use fabric conditioner on my kids' clothes (too bad!). So, my guinea pig is my toddler. He also has a sensitive skin but it doesn't react right away. I tried both Bath and Shampoo on him. Unfortunately, after two days, rashes appeared on his forehead. So I decided to stop using it. Another downside that I've noticed on the product is the packaging, it is hard to open. I think it will be better if they use a pump. Anyhow, even though the Bath and Shampoo was not a success, we will enjoy using the Powder, Cologne, and Lotion for now. My Sister whom I shared some items way back also loved these products. When she found out that I received some samples, she pleaded for it. 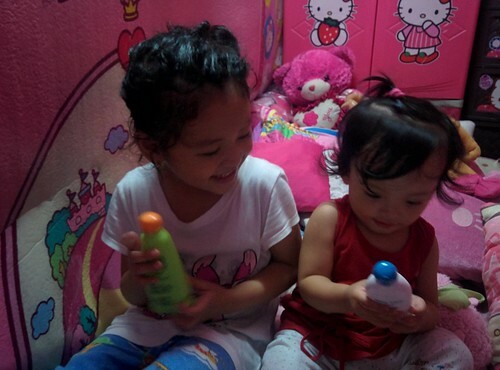 So, here are my nieces, looking happy after receiving the products. 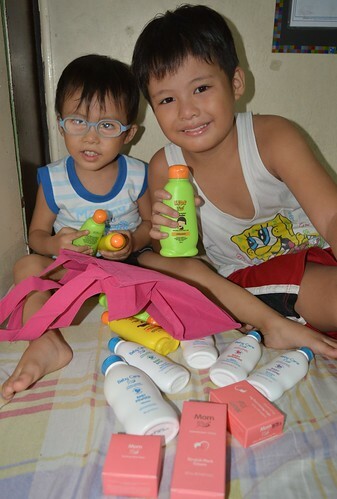 Not only the kids received a treat from Tupperware Brands, we also received samples of Mom Plus+ Products. Helps improve elasticity and suppleness of the skin to reduce the appearance of stretch marks caused by pregnancy or weight gain. With skin-softening moisturizers that gently cleanse and refresh dry skin, leaving it supple and nourished. Helps replenish skin's natural moisture by ensuring deep skin hydration all day long. Leaves a cooling sensation that soothes muscle pain, skin irritation or any feeling of discomfort. I tried the moisturizing bar and the soothing relief balm. The soap bar doesn't have a strong smell making it gentle on the skin. You can easily rinse it off leaving skin soft and smooth. The balm is really cute! I like the packaging. Actually, it can be confused with a lip balm, if you will not check the label carefully. I also love that it doesn't have a strong smell which is common to other balms. I used it when I had a stomachache and it really helped to ease the pain. Thank you so much to Ms. Denice Joyce Diaz-Faeldonia of Tupperware Brands Philippines, Inc. for sending me these items.